These pictures are by courtesy of Michael Urlaub. Follow the link for information on the Sk system. 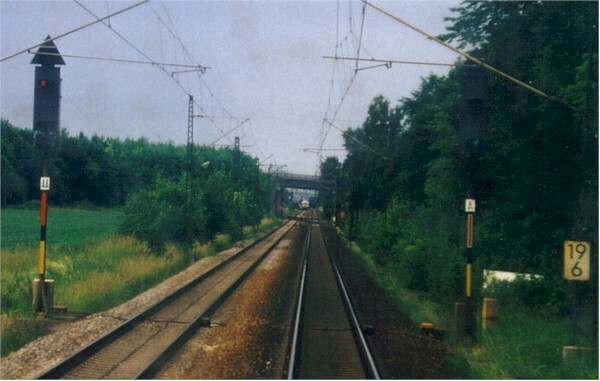 This line is equipped with Sk signals in both tracks for GWB (click for larger picture). 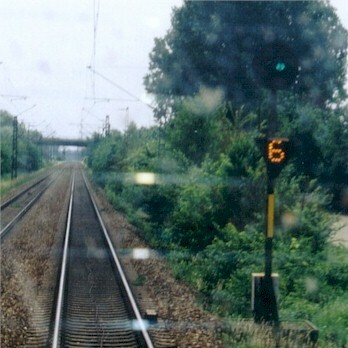 The signal on the regular track shows Sk 1 - clear, the signal for the counter track displays Hp 0 - stop. 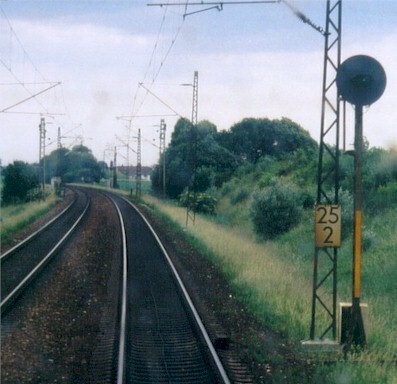 This signal heads look like the ones for the Hp system (in fact they are), but the red and yellow post plates shows that these are Sk combined signals. The "F" and "FF" boards are the signal numbers, and the white board with the 21 above 4 is the hectometre sign telling us we're at km 21,4. 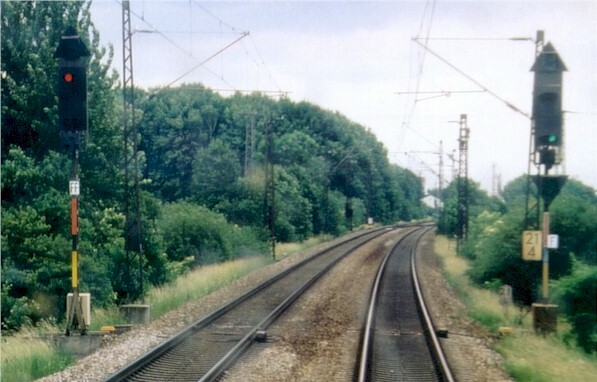 A similar view of two Sk combined signals. The yellow post plate tells this is an Sk distant-only signal. Some but not all of them have round signal heads. 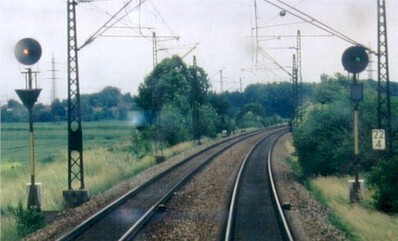 They are the only round signal heads used in Germany. The signal shows Sk 1-expect clear. Two distants, the one for the counter track shows yellow: Sk 2 - expect stop. 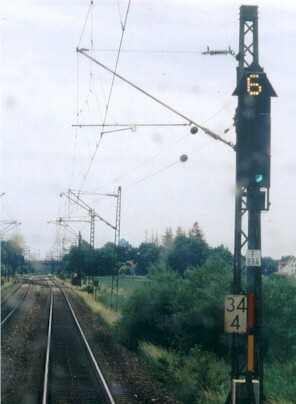 The triangular and rectangular subsidiary heads are speed announcement signals. 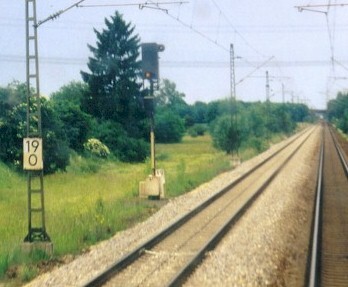 An Sk distant signal showing Sk 1 - expect clear, below a Zs 3v speed announcement signal displaying a "6", so here we see "expect clear with 60 km/h". The following Sk combined signal displaying Sk 1 - clear, expect clear. The Zs 3 speed signal tells us this is "clear with 60 km/h, expect clear". An Sk distant signal with a rectangular head. Note the small white light at the upper right of the head. This tells us that the next signal is at reduced distance or is a distant signal repeater. This one here is a repeater that has been placed because the is a regular stop between the distant and the main signal.